Whether it's for your book or for your client - or for your personal creative endeavors or job - always be thinking about what you can make that will be awesome. Not just look or sound awesome. But is inherently awesome. Something that solves a problem, answers a need, helps make people's lives better/easier/brighter and in the process, makes you rich and famous. Or at least popular. I recently took a master class at Hyper Island NY sponsored by the Ad Club and one of the biggest takeaways was - Make something people need. You can't go out of business if people need and use your product/service. Here's an example of a product/service that looks at a real-world, human problem and came up with a solution that fits right into your life. 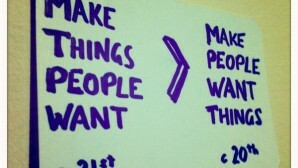 Start thinking about what you can create that solves a problem, fits into people's lives AND is awesome? This is how you'll get hired and blogged about. And most importantly, this is how you're going to go to sleep every night feeling like you added some value to the world. Size:You from Alexander Norling on Vimeo. "The Miami Ad School students are really stepping it up, and here is a great example from Alexander Norling & Sara Uhelski, who have created ‘Size You’. A Bookmarklet that once dragged into your browser bar, will automatically check your perfect clothing size on any online store, so you never have to return something you bought online again! The concept is simple, measure yourself once, enter the details on the Bookmarklet site, drag it into your browser bar and then where ever you shop, on the item page, just hit the ‘SizeYou’ Bookmarklet and it will match that items measurements against yours, to tell you the perfect size to buy. This would save me all sorts of online shopping pain"